What would an electrical engineer's blog BE without a geeky reference to Anime? I was doing shivasana (the corpse pose, the customary yoga cool-down) this evening when I was reminded of the anime film The Princess Mononoke. Near film's end the creatures in the picture emerge from grassy hills, seemingly harmless and directionless, like ameboid Caspers, but they combined into into a huge, coordinated, giant-like thing that came to the rescue (I think). The yoga instructor (the best I've had so far) was encouraging us to think about our body, where sources of support come from. I thought that almost all forms of support in one's life, physical or emotional, come as a result of nearly unconscious cause and effect. We do little things or think little things that redeem us sometime down the road, and these things are seldom noticeable and almost never grandiose. The little guys are our stumbling thoughts and efforts in life, undertaken when we are off guard, and NOT trying to effect spiritual change in our lives. They become our substance. Our greatest moments of rejuvination and insight come from the haphazard lifts we get from them. For this to come to me nearly ten years after seeing the film, and because it's a film with heavy religious overtones (Buddhist no doubt), I found it meaningful. I just thought I'd share it. Postscript. 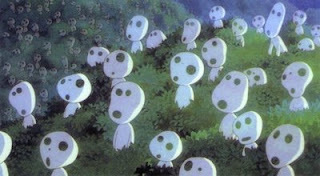 I googled it and the little guys are called Kodamas, or echoes. I'm no longer so sure if they save the day or just sit around and make peeping noises.